So I have now installed Ubuntu 12.04 on one of my computers so I could test it outside of a virtual environment. First off Unity isn't as bad as it was when I last tested it on 10.10 it is however still unusable for me. All the menus are on the top bar like on a mac (I haven't used a mac for years) I'm sure there is probably a setting to change to give you proper menus but I couldn't really be bothered with it. My main problem with Gnome 3 classic was I was unable to get rid of the bottom panel, like I was able to do in Gnome 2.x; In Gnome 3 it isn't there by default. Gnome 3 would only run in classic mode in the virtual environment because of graphics limitations. I was unable to test it completely. So here it is on a real machine. 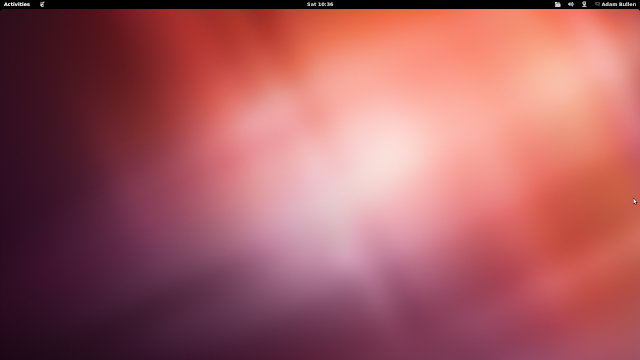 Here is the standard Gnome 3 desktop, I like the minimal look. I good friend of mine suggested that if I was using Gnome 3 that I had to look into shell extensions. After just a brief look I agree it is a must. And if you are going to use extensions (and you will) one that you HAVE to get is the extension list extension, it shows you a list of the extensions on your machine on a tab in the dash menu. But for some reason print screen doesn't work when I have dash open....annoying, something to look into. Remove accessibility icon from the top panel does what it says. I have a few others but I'm not sure they are going to stay, I really like the usage model. Go to the extensions.gnome.org site and just switch the extension on. A little popup asks if you want to install the extension say yes and there it is. Over all I am a fan of the new Gnome shell, I will continue testing it to see if I can promote Ubuntu 12.04 with Gnome shell onto my work machine currently running 10.04 LTS. It needs to be stable and have very good interaction with VirtualBox. I will need to make a decision before 10.04 hits EOL next year.